Whilst at the clinic, we met an inspiring woman called Mirkahb. Hannah (far right) sat with Mirkahb (middle). 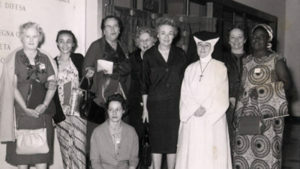 She was referred to the Daughters of Charity clinic by a government hospital after being sick very often. The clinic tested her CD4 count; CD4 is the number of white blood cells you have in your body and is how able you are to fight off infection. The average healthy person has a count between 300-1200. Mirkahb had a count of 55. Travelling to Mirkahb’s home, she seemed shy and sweet, and it was clear that she had such a strong faith. Scripture says “He counts the stars and calls them by name” and Mirkahb is a shining example of this. She reminded me that people living with HIV are more than simply statistics. Mirkahb is a widow, she lost her husband when her son was only a year old. We met her son at their house and she explained how her life has changed since her positive HIV status. Mirkahb runs a sheep-fattening business that she started with the financial help of the CAFOD partners. She also grows vegetables and makes pottery to sell at the market. Her now beautiful vegetable patch used to be a rubbish dump next to her house, but with permission from the government, she transformed it into a garden. She told me that around the time she lost her husband there was a lot of stigma around HIV, so much so that people didn’t buy her produce. Mirkahb in her award-winning vegetable garden. Thankfully there is no stigma in her community anymore. Her neighbours were so impressed with her vegetable garden that they informed the government and she received an award for being a model woman of society. It makes my heart so happy that she is not subjected to judgment due to her illness anymore. I hope that stigma can continue to decrease because it does nothing but hold back progress. When I met Mirkahb, I felt a strong personal connection. I know first-hand how an illness can affect your psychological state, so I can really empathise with her distress. She used to be afraid of life and was too unwell to work, but now she radiates strength. She has benefited greatly from the support of the Daughters of Charity, with health training from the clinic. She informed her son of HIV status last year. It took three days to fully prepare and explain to him the news. As anyone would be, he was upset at first but now is so supportive and even brings her the correct medication at times of the day she may be working and more likely to forget. Being given the correct medication, she now has a CD4 count of 600. This message is one that I understand and admire; her beauty now comes from the strength within her. Although the virus has taken a lot from her, she is now starting to believe in herself again and is starting to accept herself for who she is – and her HIV-positive status is part of that. Reblogged this on CAFOD Hexham & Newcastle Blog. CAFOD Lancaster Step into the Gap volunteer, Hannah, shares her thoughts after her first week in Ethiopia with CAFOD…..
What an inspirational blog, Hannah! Thank you. Wonderful to hear from you and to see how CAFOD partners are transforming lives. What a journey you’re on… Proud of you! Previous Previous post: Great Generation: Speak up for CAFOD this Lent!